Growing up in Pune, neighbouring city to Mumbai and the cultural capital of Maharashtra, it is almost impossible to not fall in love with traditional Maharashtrian cuisine. Marathi influence is very strong in Pune, as it was once the bastion of Maratha Empire and local cuisine is easily available everywhere. Lot of Marathi friends and neigbours means traditional mouth-watering food is just a heartbeat away. 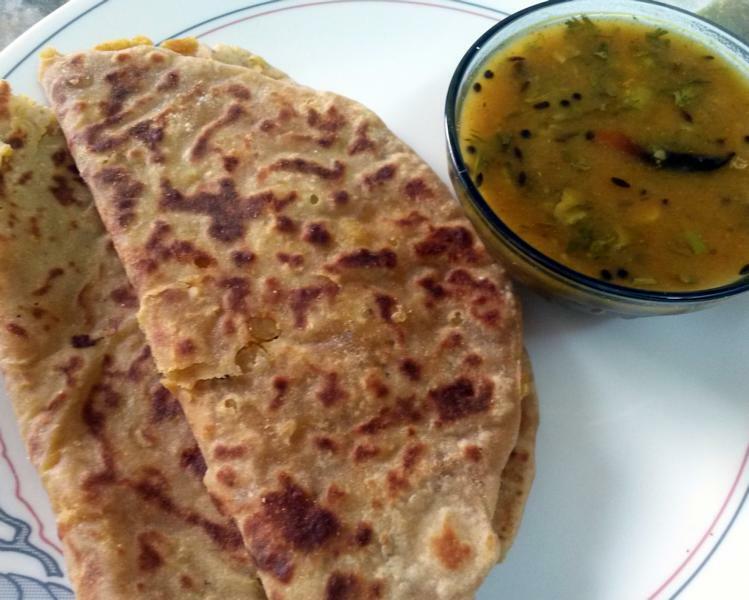 One of my favorites since I was a kid is Puran Poli. 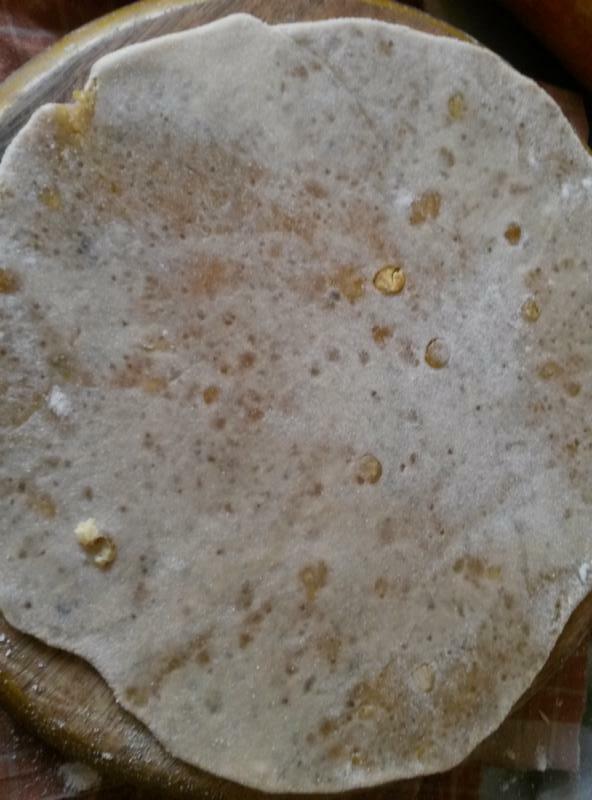 These are similar to rotis but with a sweet stuffing- called Puran; the outer cover or the Poli is made from all-purpose flour or a mix of all-purpose and whole wheat flour. Although, traditionally served as dessert, on occasions and festivals such as Gudi Padwa; personally, I’ve always found them perfect for breakfast, lunch and dinner! Puran Polis are quite heavy and could easily pass off as a full meal. They are quite popular in different regions of India and are served either with sweet milk, or tangy sauce called Amti, or just with slightly warm ghee (clarified butter). I love to eat these with Amti, the tangy sauce which is prepared using a bit of the stuffing for the polis. So in this post I am sharing the recipe for both. The stuffing can be made with a few simple ingredients – cook the Chana dal, drain water and keep aside. Coarsely mash the Chana dal. 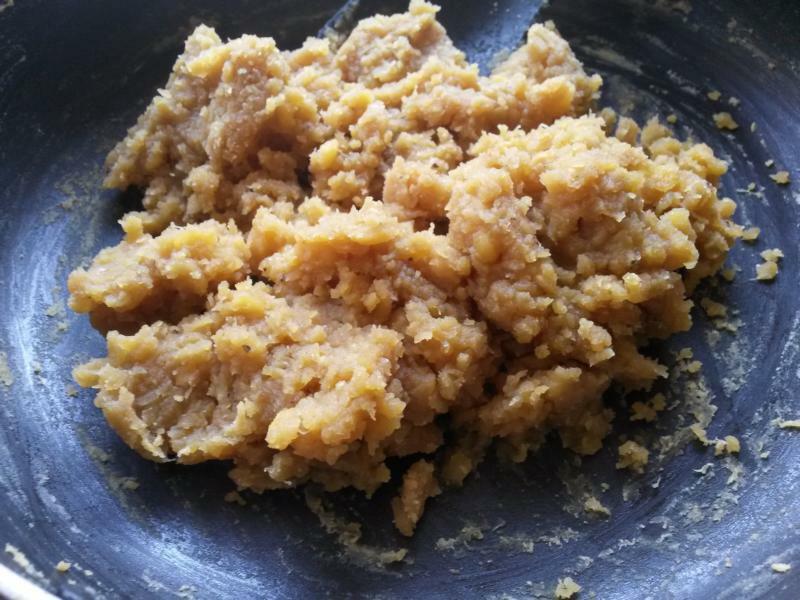 Mix the mashed Chana Dal, while its still warm with grated jaggery till all the water evaporates and the mixture becomes dry. Now add the nutmeg powder and elaichi powder and mix well till the mixture is completely dry. For the Poli, mix the ingredients and knead into a soft dough. Keep aside for around 15 minutes. Divide the dough into equal portions and using a rolling pin, roll out into a small chapati but not as big as a full chapati. Place a handful of the Puran in the middle of the rolled circle. Bring up the edges, enclosing the stuffing and seal the edges against each other. Roll them out again like chapatis or parathas. 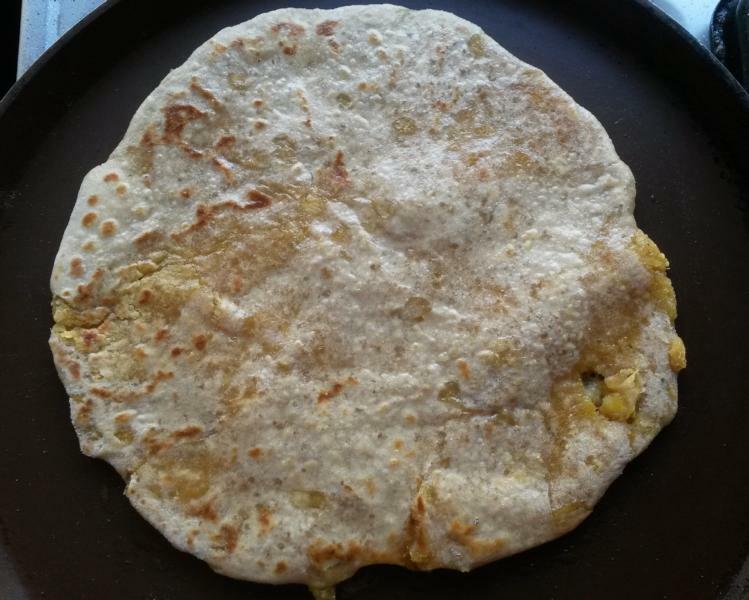 On a flat pan, cook the Puran Polis with ghee till light brown on both sides. 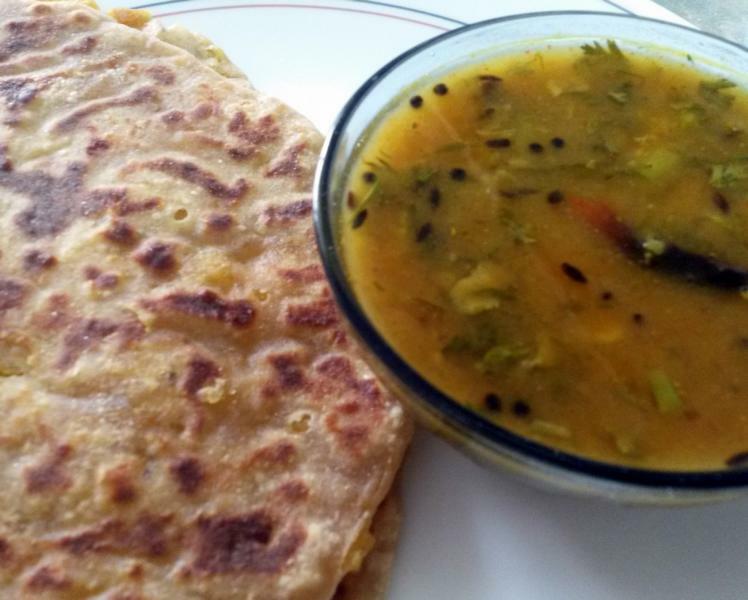 This can be served with just a hint of warm ghee. But I love these when served with Amti– the slightly spicy-tangy taste of the sauce complimenting the sweetness of the Puran Polis. 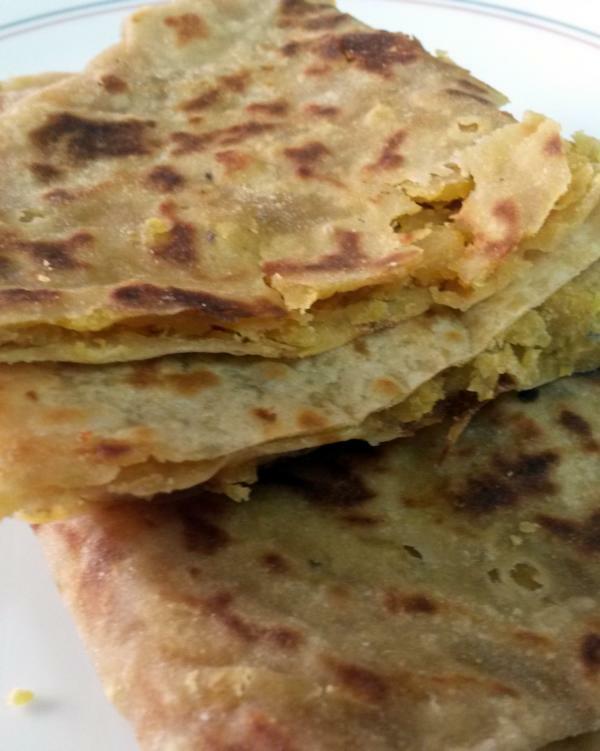 The main ingredients are some of the Chana dal from the stuffing, the drained water, jaggery and tamarind pulp. And of course a few spices for tempering. 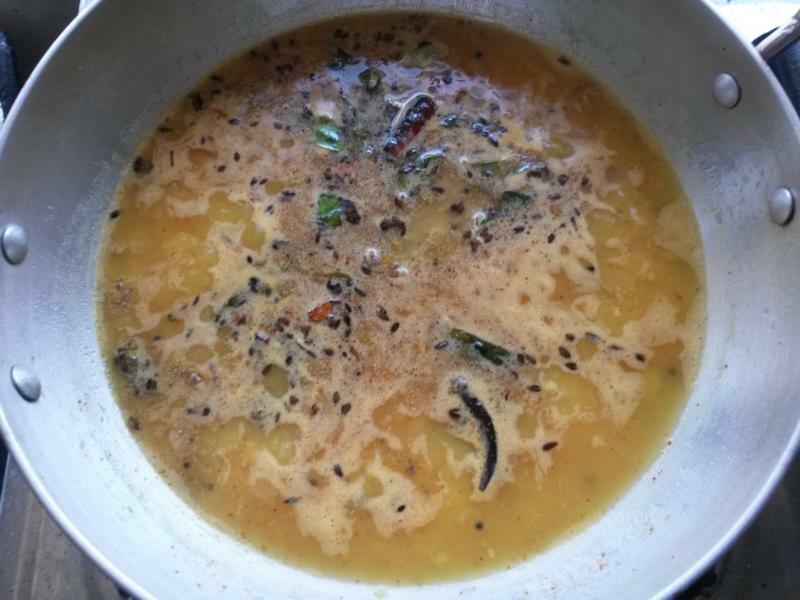 In a deep pan, heat some oil, add mustard seeds, followed by cumin seeds, asafoetida, curry leaves, green chillies, red chilli, bay leaf and cinnamon. Add the Chana dal and the water. Once it begins to boil add the jaggery and tamarind water. Finally follow it with the spice powders and boil for a few more minutes. Garnish with chopped coriander. Coarsely mash the cooked Chana dal. 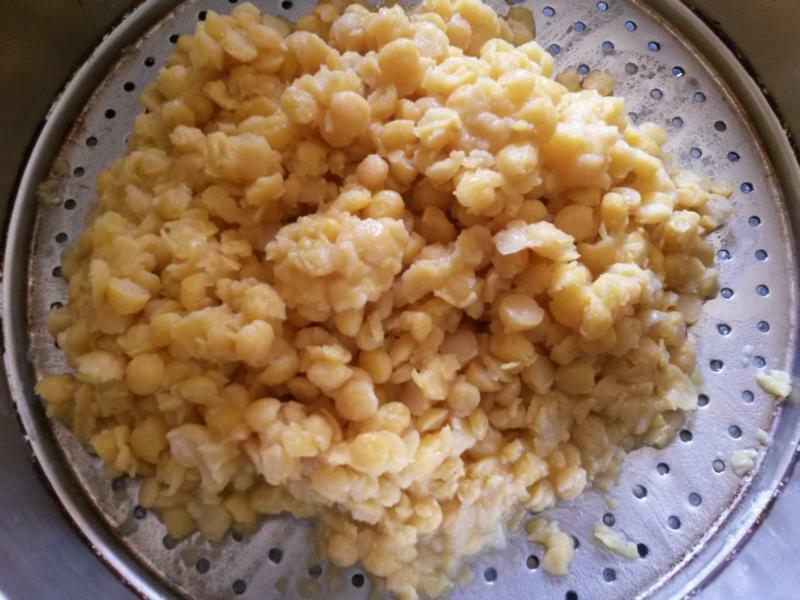 In a deep pan, mix the mashed Chana dal while it is still warm with grated jaggery till all the water evaporates and the mixture becomes dry. Now add the nutmeg powder and elaichi powder and mix well till the mixture is completely dry. Let it cool. For the Poli, mix the two flours, salt and bring it together adding little water at a time. Towards the end, add ghee and knead into a soft dough. Keep aside for around 15 minutes. 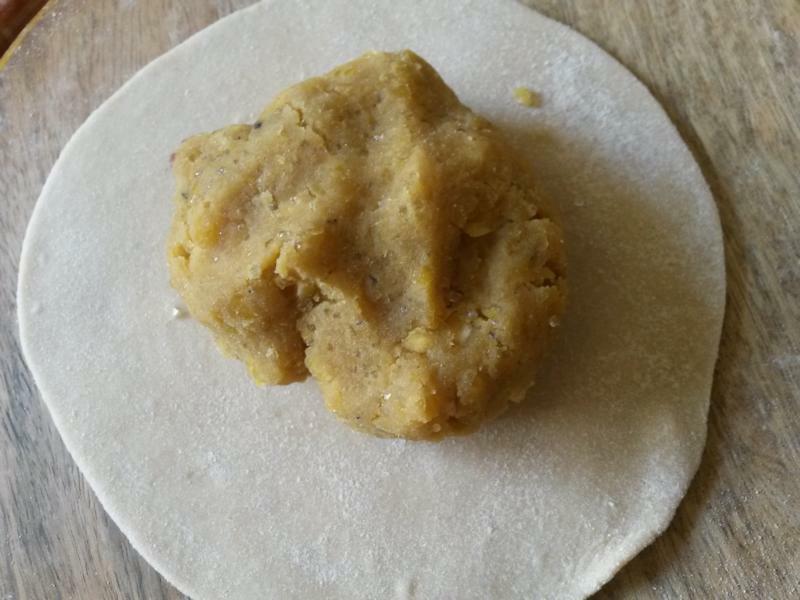 Divide the dough into equal portions and using a rolling pin, roll out into a small chapati but not as big as a full chapati. Make it into a small circle and then take a handful of the Puran and place it in the middlle of the rolled circle. Enclose and seal the edges and roll them out again like chapatis or parathas. Heat a griddle or flat pan, placing the Poli on the pan, cook both sides on medium heat. 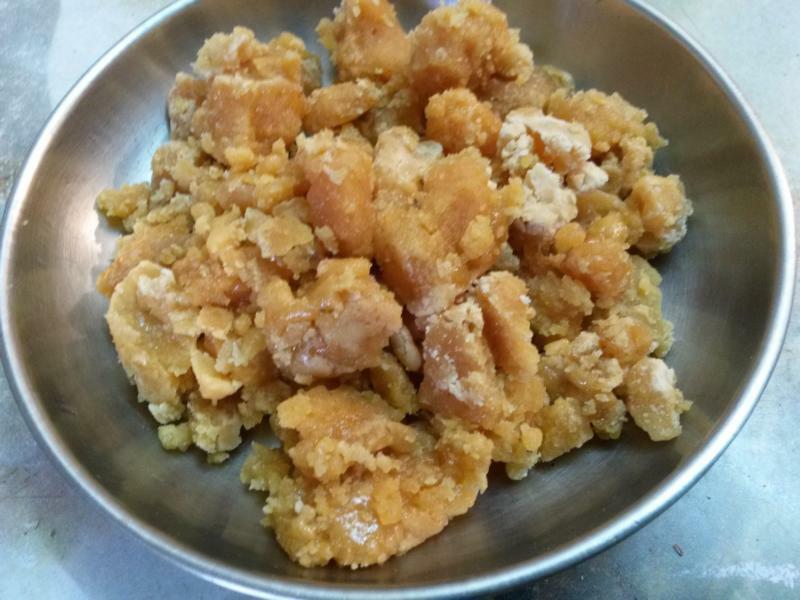 Each time the poli is turned pour little ghee and cook till both sides are light brown. 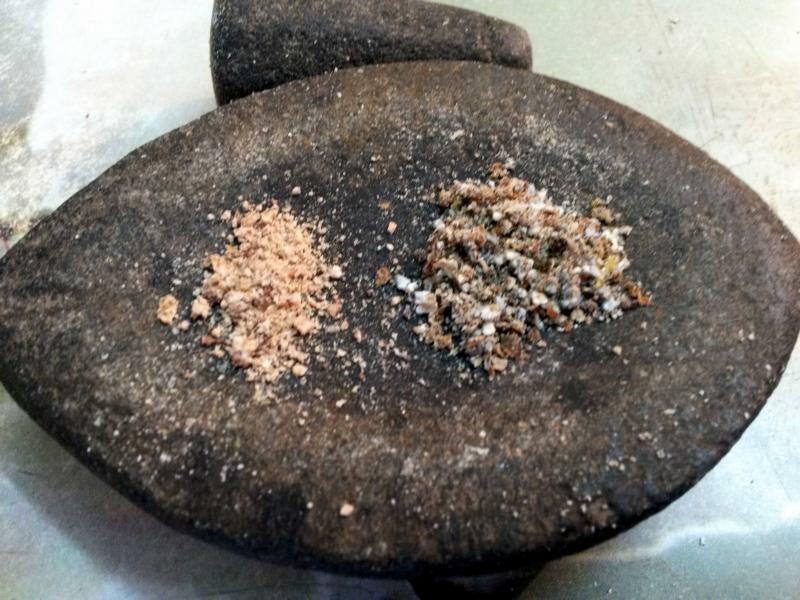 Serve hot with a dollop of ghee or with Amti. In a pan, heat 1 tblsp oil, add the mustard seeds. When it begins to splutter add the cumin seeds. 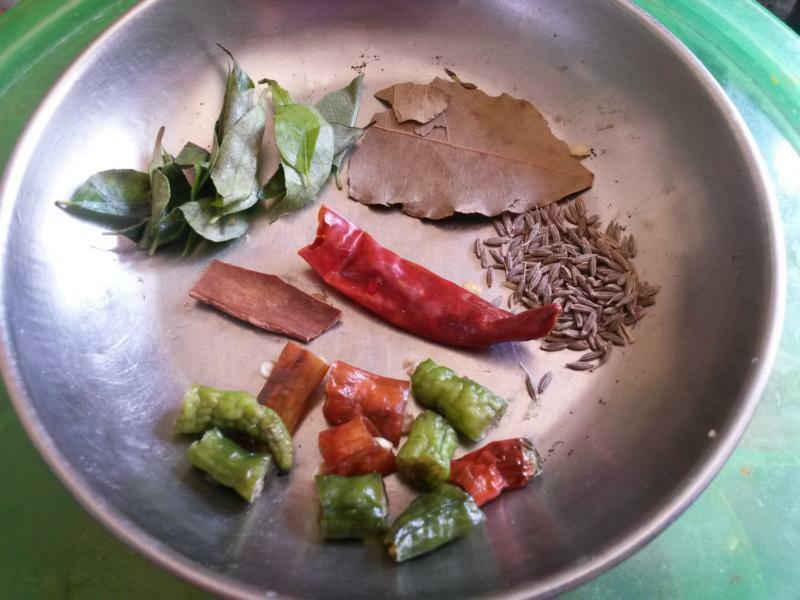 Follow by adding, the asafoetida, curry leaves, green chillies, red chilli, bay leaf and cinnamon. Add the Chana dal and the water. Once it begins to boil add the jaggery and tamarind water. Add the spice powders. Let the mix boil for few minutes and then add the coriander leaves for garnish. Serve hot as an accompaniment to the Puran polis. 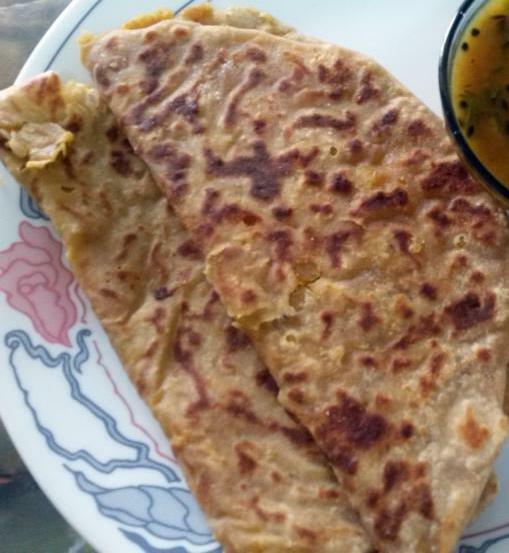 Here in South India we call this Puran poli as “Boli”. We also prepare it the same way. I like to have it ghee 🙂 Just Yum, i must say!! Hi Aruna, you must try it. It is a very typical combination in some parts of Maharashtra. Tastes very nice..
Wow! My mouth iis watering. Being born n brought up in Pune, this is one of my fav dishes.I try to make it very often, but doesnt turn out so tasty. Will try out this recipe now. Thanks. The Puran Poli looks delicious. I love it! Oh God I would love to make this flatbread. It sounds so delicious! !